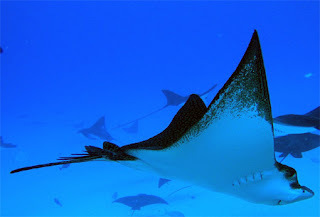 EAGLE RAY CITY (B)- Eagle Ray City is one of the most unique dives in Saipan. Rising out of the sand at a depth of 30 feet is a rocky formation that on a good day will have up to 40 Eagle Rays hanging out. 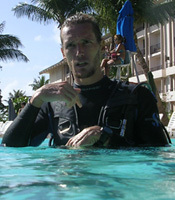 While divers hold on to the rock Eagle Rays glide overhead. Do not approach the rays. If you wait long enough the naturally curious animal will come and check you out. At times they will hover mere inches above your head. Current: General rule here is; the stronger the current the more Eagle Rays you will see. Using the anchor line to make your way to the bottom it is only a short swim to the rock. By staying close to the bottom and sticking your fingers in the sand you should have no problem getting to the rock formation. Reef hook is not needed. Tip: Bring 2lbs extra weight that way you'll sit nicely on the bottom. 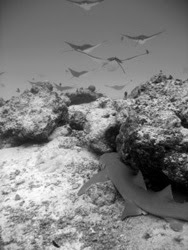 This tawny nurse shark was hiding at the rock formation at Eagle Ray City. I still have a hard time finding the spot and have not put the general area in my GPS cause I'm never that close. Try this line up. Line up the bow with the Tanapag church (you should be able to see the tip of the chapel) with the crack in the mountain (pretty obvious which crack it is). At starboard line up the metal tower at CUC with the North side of Coffee Care or Vescor Village.